The price of homes in Greenwich borough dropped by 3% in a month alone as London continues to struggle against the backdrop of Brexit, a stagnating European economy and China seeing the worst growth in 28 years. Annual falls in the borough were 7.8% knocking almost £40,000 off the average house price. The borough saw the fourth highest number of new-builds across London and it’s in that area where demand is particularly weak. 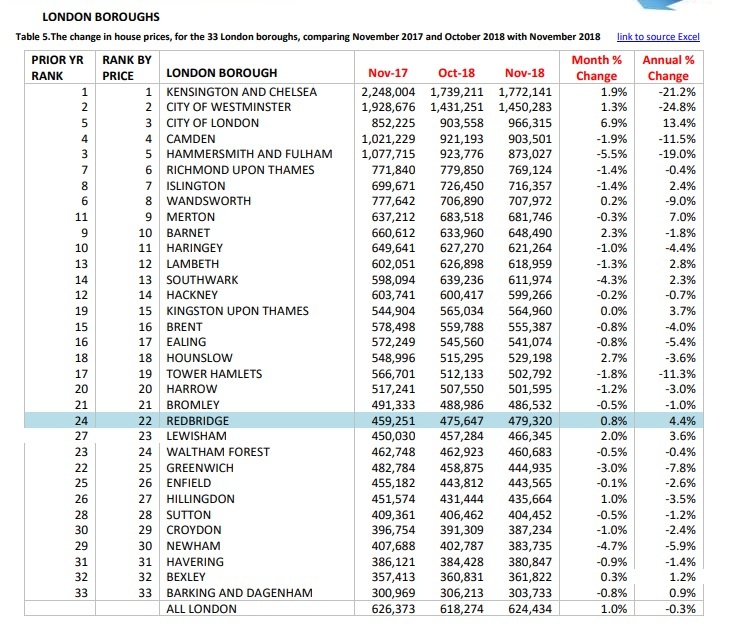 Newham saw an 11.3% annual fall. Many homes are now beyond the reach of local people and developers have become reliant on overseas buyers. Yet the Chinese economy has hit trouble – which is also affecting major companies such as Apple. Crossrail’s delay could also be a contributing factor though falls started to be recorded in the borough before the delay was announced. Overall in London prices are falling – and yet being propped up from bigger falls by areas such as the City of London rising 13% on the year based on a tiny fraction of sales. Only 12 properties were sold in the entire month of November. Demand for housing is still extremely high in London though prices are now far beyond historical ratios of average wage to average house price, and so many can’t afford to buy. Short term schemes like Help to Buy assisted those who got in first before it pushed up prices further within a short period thus exacerbating the underlying issue. Banks and developers could ask for a smaller deposit but that risks the inherent stability of the financial system. It’s heading back to the pre-financial crash zero-deposit era which went so badly wrong. There’s a real danger now that private developers will begin to mothball sites. That stores greater problems unless the public sector compensates. The private sector alone has never build anywhere near the levels needed in the UK for over a century. We had a situation where most local buyers couldn’t buy and even the feeble amount of “affordable” homes was reliant on overseas buyers. A sure-fire sign the whole system is heading to the rocks. This data comes from LSL Acadata which along with the Land Registry is the most comprehensive source of data. Other indexes are selective such as Halifax or Nationwide. It offers an earlier insight into long term trends. You probably won’t see this reported in many newspapers or local news websites however as they are more reliant on adverts from property developers than ever before – and house price falls are not good news for them. Indeed, one paper closed last month and blamed declining adverts from developers. Good news for people who need a home but a long way to go until affordable to most. Bad news for speculators like landlords – who have a slew of bad news coming their way with increased tax again from April. Some must be selling up lowering prices for first time buyers. As tax increases over time more will sell. However some people will fall through the cracks so public building must ramp up. Ultimately though getting buy to let out of the system to some degree is the target. Here’s a radical suggestion: the developers could sell to the council at build cost who would in turn add the homes to the rental stock. No, I’ll get me coat.